The courier taking Connie and the other birds from the lab to the observation center dropped her cage in the parking lot and she was the only one he didn’t catch. Now she was free. The coturnix quail hadn’t eaten in a long time. “I’ll get you some bird seed.” The seven year old ran off, and Connie stayed because of food and decided to live with Eloise. The longevity researchers gave up on the serum experiments because Connie went missing. Both she and Eloise lived another seventy years. I wrote this for the Rochelle Wisoff-Fields photo writing challenge. The idea is to use the image above as the prompt for crafting a piece of flash fiction no more than 100 words long. My word count is 99. I know the photo Rochelle posted isn’t a coturnix quail (commonly known as a Japanese Quail), but ten seconds of Googling didn’t reveal the species in question so I faked it. I did discover that Japanese Quail have been a popular laboratory research animal since about 1957 and is used in the studies of aging and disease. The lifespan of this bird is about two to two-and-a-half years. Of course my experimental bird Connie lived a good deal longer and was a kind and loyal companion to Eloise all the days of her life. ← Is There a God in the Moon? I tried to say that in the story, but I guess I wasn’t clear enough. Cool! I had no idea! Neither did I until I looked it up. Sadly, Connie is fictitious and there are no 75 to 80 year old quail. Chuck Jones’ roadrunner is 79, so there’s that. He’s almost a quail. I’ll give it a read when I have the bandwidth. Thanks, Susan. Fate intervenes, perhaps this discovery was just not mean to be discovered! Loved the idea that Connie and Eloise lived happily together for such a long time. Yes, it was my “happily ever after” moment. Thanks. Nice irony at the end. Great thing for the girl to have a bird for her whole life… maybe they had a great life together. I’m sure they did, Björn. Thanks. Such a lovely, heartwarming story. Fate they say hangs on such moments. It did for one bird and one little girl. Thanks, Mike. I enjoyed your heart warming tale. I think so, too, Penny. Thanks. Darn, it worked too! I’m glad Connie escaped and they had a nice long life together, though. Better than being observed and dissected. That much is true. Thanks. I love the name you gave the bird. Connie is so warm. She is that, Alicia. Thanks. Yes, they are tasty. 😀 Thanks, Liz. Thanks, Plaridel. Maybe I should have used it for Mindlovemisery’s Menagerie “Happily Ever After” prompt. 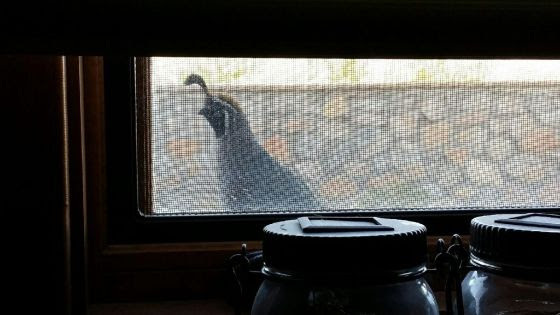 I believe it’s called a California Quail. It sounds like the escape worked out to Connie’s advantage. Nice tale. Finally a happy ending for the poor bird. I love this, the little girl found a friend for life, and so did Connie.